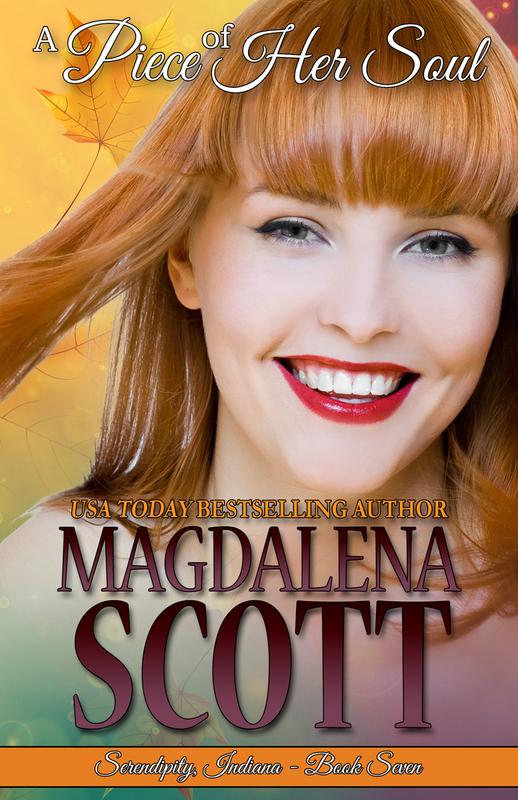 Sweet romance meets light paranormal. Don’t miss Autumn in Serendipity! Nick Marshall has a hole in his soul, and Jacqueline must help him find the missing piece. Their teenage history in the gossipy town of Serendipity compounds the situation, as Jacqueline’s visit to help her injured mother (Reba Markland, EMILY’S DREAMS) turns into something more. The little town hasn’t changed much–the gossip tree still has branches and roots everywhere, most folks remember the town’s past better than they can imagine its future, and the autumn colors are more beautiful than anywhere she’s traveled in the years since she left. Jacqueline’s gift is needed here, but she won’t risk her heart, or put her family in the spotlight, by staying. I’d been fixing dinner in my RV, but at my sister’s words, all the air left my lungs. I shut off the gas burner, and collapsed into a captain’s chair with my cell in hand. The chair started to spin. “She’s going to be okay—as in, she has broken bones that will mend? What?” I know my tone was less than sweet, but I’d been blindsided by Jen’s news. “You’ve discussed it with Mother, too, right?” Jen and her husband would try to do the best thing for Mother. But she should make the decision for herself, if possible. “Mother’s not really able to talk about it now, Jacquie. She isn’t herself yet. The meds.” Jen sounded exhausted. That’s all I needed to hear. Mother had always been a rock—for many people, but particularly for me, the wayward daughter. When she got out of rehab, she’d be eager to get back to the home she loved, that she and Dad had built. If I could make it an easy, safe option, that’s what I needed to do. Until this accident she had been busy and vibrant, taking trips or doing projects with her best buddy, Lillian Standish. She made meals and delivered to folks who were ill or bereaved, volunteered at a couple of nonprofits in town, participated in at least one book club… I didn’t know all of it, but I knew Mother wouldn’t be ready to give up—or at least shouldn’t be. “Around the first of October, the doctor says.” Her voice was strained. Did Jen doubt my sincerity after such a long absence? Resolved, I made a mental inventory of the tasks I’d need to finish, avoiding a close scan of my paper calendar. My cat, Sam, jumped onto my lap, demanding to be stroked. Meaning, Jen wasn’t sure quite I’d come through on the promise. I couldn’t blame her for being cautious. If Mother got excited about me returning so she could be home, and then I didn’t show up, that would stink, and Jen would be left playing clean-up. “Yes. Sure, I will. And of course I thought of you. I think of you a lot, Jacquie. Miss you.” I could imagine the look on her face. A little bit dazed by my stated intention. By the possibility of the absent sister showing up and doing the right thing. If she only knew about my relationship with doing the right thing. She was better off thinking whatever she did about me. But the truth was, I didn’t need to run. I’d been running for years, and it was time to do the opposite. I had felt pulled toward Serendipity for a while, and now there was no putting it off. I hoped I was strong enough to do what would be required of me there. 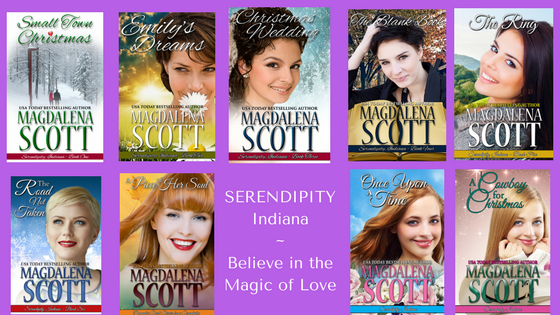 There was no doubt that the gossip tree of little Serendipity, Indiana would start buzzing with news of my reappearance, as soon as someone recognized me. I couldn’t let myself care. My purpose wasn’t to impress anyone or win a popularity contest, but to help Mother, and Jen. On the other hand, what I needed right now was a nice, quiet cave to hide in. A cave that wasn’t cold, damp, or dark, but well-lit and airy, with a lovely view of… Okay, not a cave. I could make do with an out-of-the-way camping spot for my RV van, with no close neighbors, and breathtaking scenery on every side. I needed a place to rest, and to heal. Unlike Mother’s injury, mine was invisible. And I intended to keep it a secret from everyone who wasn’t already aware of it. My focus was on Mother, not myself. To have an extended period of time with her would be a treat, in spite of the reason for it. As long as Mother and I were in her house together, or just around our family, I should be fine. But what about the proximity to so many people I’d known back in the day? I shivered at the possibilities. A few years ago, in a fit of homesickness, I had considered a visit. I pressed Jen to tell me what people thought of my absence, and she finally conceded to my prodding. “Sad to say, yes I do.” The fact that I knew, much too intimately, how people are should have warned me off the question, and off of expecting to ever feel at home again in Serendipity. Jen gave me frequent updates, and I phoned Mother every day, hoping to keep her spirits up. But my coming back was kept a secret between me, Jen, and Marcus. He sent me a text telling me how glad he was about my return. That Jen was looking forward to it like crazy, and Mother would be super excited. It was a nice message, but contained a statement between the lines: I needed to fulfill my promise, so I wouldn’t hurt both of those special women. I sent him a quick text back. Jen found a great guy in Marcus. He was devoted to her, a wonderful dad to their children, and intensely loyal. He was also as good to Mother as a son would have been. He managed to tolerate me, and I couldn’t expect more. The day I drove into town was weird. In this little place where people easily recognized each other by their vehicle, no one knew who was behind the wheel of the sleek, dark van with tinted windows and an out-of-state license plate. I came onto the square, navigated the roundabout, and found a parking space. Turning off the engine, I silenced Diana Krall’s soothing jazz, took a steadying breath, and emerged into Serendipity. The old hometown looked the same, but different. There were a couple of empty store fronts on the square, and several homes and businesses on the main drag that needed paint or other exterior upkeep. Serendipity was having a hard time entering the 21st century, even though the rest of the world had done so a decade and a half ago. The bell jingled over the door of Emily’s Dreams consignment shop as I entered, and a customer and the manager glanced at me. The manager—my sister—gasped, the customer looked confused by her reaction, and I avoided an introduction by stepping into the side room to browse. A few minutes later the bell jingled again, and Jen was in front of me. “Yes, they’re great. Still, I look forward to never seeing the inside of this place again.” Her laugh sounded rusty. She pointed out the entrance door and I parked near it. She wanted to, I knew. I closed my eyes against the memories of our issues in the past. If she was willing to set those aside, I could, too. The perfect neighbor for Mother, but having Nick next door was an unwanted reminder of the past, for me. I pushed the thought aside where I had tried to keep it ever since Jen’s call. If I ran into Nick, which was almost certain, I could deal with it. I wasn’t a young girl with a heart in danger of being broken. Nope. I was a woman who felt ancient before her time, with a heart that had nearly dried up from neglect and hopelessness. I put an arm around her shoulders. “Thanks, but there’s no need for you guys to do that. I’ll handle whatever happens.” It wouldn’t be easy, but nothing in my life was simple. We’d been speaking in low tones as we walked along the hall. Jen gestured at the door number I’d been looking for, and we paused briefly, before stepping into Mother’s room together. Jen and I exchanged a quick look at Mother’s reaction, and did what we’d been told. She still held my hand, and I wondered if she planned to let go any time soon. At least it was reassuring that her strength was good. “So wonderful to have you home, Jacqueline.” It wasn’t home to me anymore, would never be that again, but pointing that out would only make us all feel bad.